Sew a slice of life with 12 traditional quilts that prove to be more than just patterns but storytellers. Each quilt is inspired by life events that everyone can appreciate. Bold blocks shimmer in their use of colour, value and repetition for handsome quilts with personality to boot. Repeated blocks will stretch your skills beyond the basics, inviting you to perfect techniques such as strip piecing, half-square triangles, working with templates, paper piecing, machine applique and sewing set-in seams and curves in a way that's easy to understand. 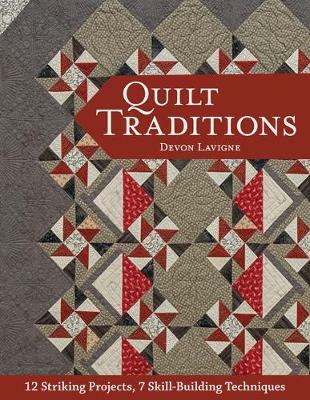 What a wonderful way to learn traditional quilting. 12 great projects and 9 skill-building techniques. Each quilt has a story to tell. Good design is the basis of this interesting book. Perfect your quilting skills with strip piecing, half-square triangles, templates, paper piecing, machine applique and sewing set-in seams and curves. You can see how the harmonious colour selections enhance these wonderful quilts. Easy to follow instructions and clear photos and diagrams seem to make the process easier. I really enjoyed this book.